Police preventing UDMF cadres (unseen) from entering the venue of the UML rally at Maleth of Saptari district on Monday. RAJBIRAJ, March 7: Four* protesters were killed in a clash between cadres of the United Democratic Madhesi Front (UDMF) and security personnel, at Maleth VDC of Saptari district on Monday. UDMF said they were killed when police fired at the protesters. Those killed are Sanjan Mehta, Pitambar Lal Mandal, Ananda Sah and Digambar Yadav*, said the UDMF in a statement issued after a meeting it held in Kathmandu Monday evening. 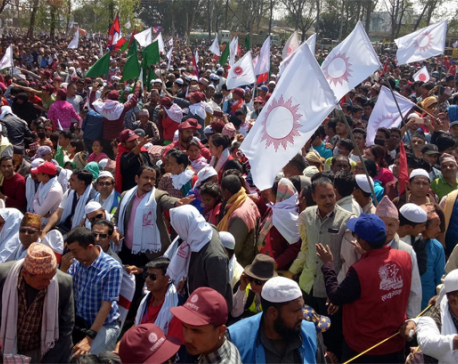 The clash occurred when the protesters tried to obstruct a mass meeting organized by the main opposition CPN-UML at Maleth, Saptari district. Police Spokesperson Sarbendra Khanal confirmed the death of three protesters. “Three deaths have been confirmed. There is also a report of one more death. We are yet to confirm the fourth death,” said Khanal. Local witnesses assume that the death toll may increase as some of the protesters are said to be critically injured. Mehta, who was shot in the head, died on the spot while Sah breathed his last during treatment at the BP Koirala Institute of Health Sciences. Mandal, who had received a bullet injury to the stomach, died in the course of being rushed to hospital. Dinesh Kumar Yadav, coordinator of Unified Democratic Madhesi Front in Saptari, informed that at least a dozen protesters were injured in firing while an additional 25 were injured in baton charge by the police. Of them, 14 injured were taken to BPKIHS. Half a dozen security personnel are also said to have been injured in the clash. Madhesi leaders were protesting against the UML gathering soon after the leaders of the main opposition party on Saturday launched a nationwide election campaign starting from Kakadvitta, Jhapa. 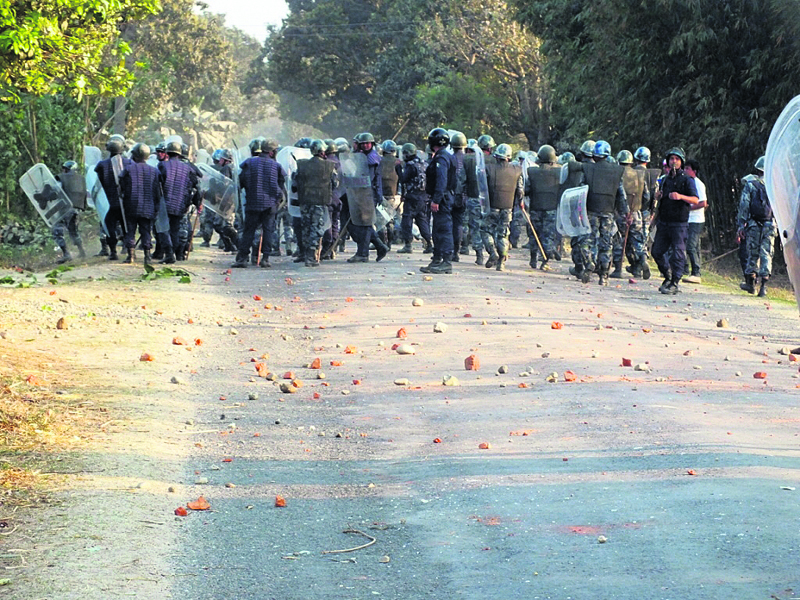 Fearing possible clashes between the agitating Madhesi forces and UML party leaders, a large number of security personnel were mobilized from early morning, Monday. The security forces deployed at the venue fired several rounds into the air and also dozens of tear-gas shells after baton-wielding protesters attacked the gathering with bottles filled with petrol, targeting the program venue. Locals supporting the agitating Madhesi forces had gathered from various parts of the district before the UML leaders and cadres assembled at the venue. The agitating UDMF had imposed a general strike in Saptari district to disrupt the UML’s program. UDMF cadres carrying sticks and bamboos had gathered from the morning. Originally, the UML had planned to hold a mass meeting at Raj Stadium of Rajbiraj, district headquarters of Saptari. But the party later shifted the venue three kilometers north to Gajendra Narayan Singh Industrial Area to avoid any clash with UDMF cadres. A rally of the UML had entered Saptari in the afternoon together with top party leaders. The rally however was greeted with black flags at some places along the East-West Highway. The situation took a nasty turn after leaders and cadres of the Madhesi parties chanted slogans against UML Chairman KP Sharma Oli and attempted to obstruct the program by burning tires around the program venue. Police said they used force to disperse the protesters after they got attacked. Tensions ran high after the protesters pelted stones at the leaders attending the mass meeting, which later compelled security personnel to open fire. Security officials have said that they had no alternative but to open fire to keep the top UML leaders safe. Over a dozen tear-gas shells were fired to take the situation under control. UML had launched a 15-day Mechi-Mahakali rally on Saturday, claiming to dispel ‘rumors’ against the party regarding Madhes issues. The party began the campaign on Saturday and this was the first district in Province-2 it was holding its rally in. Madhesi parties have been demanding that the local units in the southern region of the country be increased based on population and the constitution amendment bill be endorsed from parliament prior to the local polls. But the UML has opposed the constitution amendment and has insisted on holding the elections. Meanwhile, CPN (Maoist Center) leader Narayankaji Shrestha has said the party was very sad to hear about the death of protesters in Saptari from police firing “in spite of the prime minister’s instructions not to shoot”. “How did it happen? Let all restrain,” he tweeted.